There are many factors that determine how much new vinyl siding costs, but one of the biggest is quality. Not all vinyl siding is the same, and there are many good reasons why homeowners interested in purchasing new vinyl siding want to go with a higher-quality material. Thicker vinyl siding stands up to aging, weather, and other stresses much better than thinner vinyl siding. Cheaper siding also can show imperfections in the framing--wall studs have a natural "crown," or outward curve, that carpenters face to the exterior when building. Thinner vinyl siding often shows these slight bulges when they are next to studs without much crown. The result is a "wavy" looking wall. 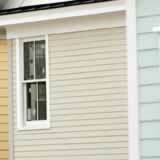 Thicker vinyl siding is much more rigid and hides these imperfections. Another major factor in determining how much new vinyl siding costs is style. Vinyl siding with a plain look costs less than siding with decorative styles, such as Dutch lap, board and batten, vinyl shake, etc. Siding with a standard horizontal lap won't be as expensive as these fancier styles. Lastly, manufacturers prices vary slightly as well. Expect to pay between $.45 and $1.90 per square foot as a very rough estimate. With those numbers in mind, cladding a 2,300 square-foot home costs between $7,575 and $11,575 depending on what grade of siding you purchase. When comparing vinyl siding costs, make sure you are comparing the same grade, or thickness, of material.